Richard contacted Castle Ring Oak Frame with a bit of a problem. Having already obtained planning permission for a 3 bedroom oak framed extension and purchased the sawn oak himself, he suddenly found himself let down by his original timber framer. Could we pick up his project, (fully designed) and run with it. Oh, and could it be ready in 4 weeks as the goundworks were done and dusted! Up for a challenge and with some careful workshop juggling we had the first cross frame laid up and fully assembled on trestles within a week. Richard’s face was a picture when he came to inspect progress, in fact it was a while before he could get his mouth to work. Framing continued apace and we hit our target date for the raising. Richard’s extension is a half-timbered panel construction, a requirement of the planners in this case, to blend in with neighbouring properties. Special detailing must take place at design and manufacturing stages to enable the panels to be fitted within the oak in such a way to both insulate and maintain weather proofing as the oak shrinks. Consequently the raising generally proceeds at a slower pace to allow for the fitting of lead sills and expanding weatherproof foam tapes between joints. That said, we still managed to top out the frame within a day, much to Richard’s relief and the delight of his wife Cezz and toddler Max. 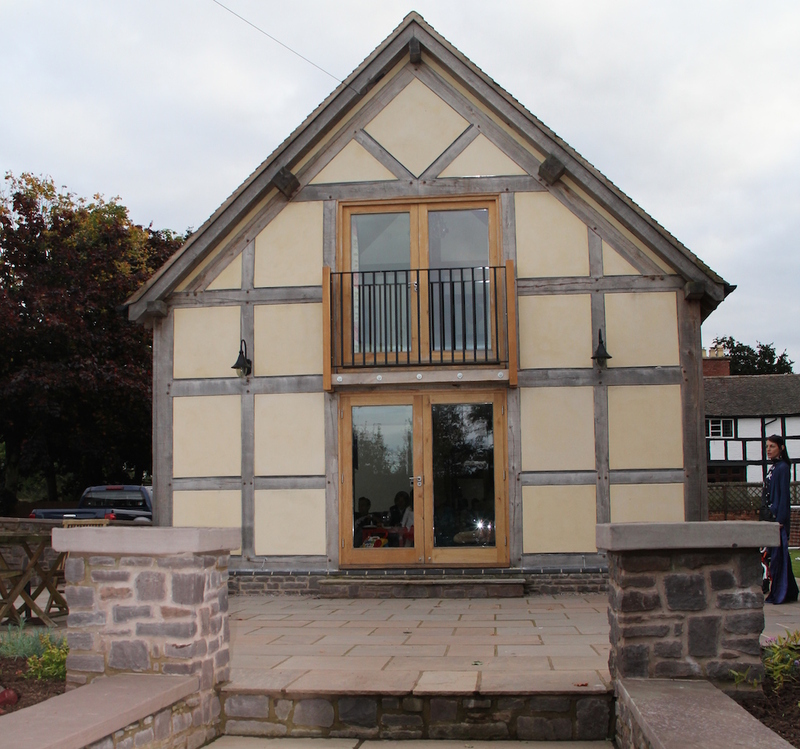 Richard was then able to proceed at his own pace with the build, constructing and fitting the infill panels, and closing in the roof with softwood rafters. It is a testament to his skill and dedication as a self builder that he has produced a beautifully finished and detailed extension on an extremely tight budget.